Based upon your device you will be looking at an adapter in one of two categories. A universal adapter or a device specific adapter. Below I will describe how to select the correct adapter for your device. 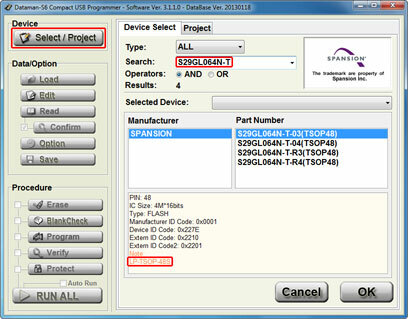 All the information required to select the correct universal adapter or device specific adapter can be found in the control program for the programmer. This can be done without the programmer connected. Open the control program, click "Select / Project" and enter the part number of the device you would like to program into the "Search" box. When you have found the device you would like to program, click on it once so it is highlighted. The section below the device part number shows further details about the device and which adapter is required. If no adapter is shown, then no adapter is required.